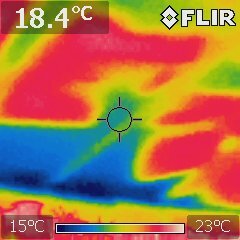 The ‘eco-house’ hasn’t got off the drawing board yet but I’ve been having fun today with a thermal imaging camera in our Glasgow terrace. I have always known that our kitchen (an extension added 10 years ago by the previous owners) was leaky and causing drafts and have tried to grovel about under kitchen cabinets unsuccessfully trying to remedy it, but what I didn’t realise was that the insulation in the sloping roof was installed incorrectly or has shifted. A friend brought over his thermal camera which cost him the tidy sum of £1000(!). We crept around the outside of the house in the dark like ghost-busters seeking a sign from the other side, pointing the camera (which is far more like a ghost-detector) at corners and vents. Interesting enough, but the far more interesting pictures were of the inside of the house. This photo, looking up into the corner of the kitchen, shows the window at bottom left with fairy lights along the top and a large patch of cold (blue) in the roof the insulation is missing. A closer measurement of temperature showed that the temperature in that corner near the ceiling is only 4 degrees. 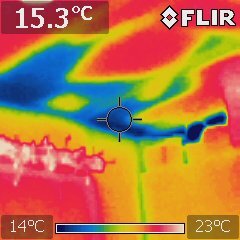 In this photo you can see the sections of insulation (in red) and the roof beams (mainly green) showing through as cold bridges on the sloping ceiling. These photos would indicate that we need to take some action. However that action would probably necessitate the tearing up of the kitchen floor (to eliminate the stubborn drafts coming from under the cabinets) and the ceiling (to insert/reposition insulation). It seems far easier just to build a new house ……. This entry was posted in Building the House at Cuil Bay, Uncategorized and tagged draft-proofing, eco-home, efficiency, insultation, retrofit, thermal imaging by nager. Bookmark the permalink.